A nursery glider provides a comfortable, convenient and relaxing way for mothers to nurse or breastfeed their babies while at home. The rocking motion also provides a soothing experience for both the mother and the baby. With this in mind, you might definitely want to consider buying a glider and ottoman set for yourself if you don’t want to miss out on the comfort and relaxation that such a product provides. This guide on the best nursery nursing gliders 2019 is all you need to ensure you choose a great nursery glider that meets your nursing or comfort needs. If you’re new to gliders and ottomans and you don’t know the exact features you need to consider before making a purchase, then we highly advice you to read through our detailed buying guide just below the reviews on choosing and selecting a glider and ottoman set with the features you’ll be grateful for. This will prevent you from wasting your money on a glider chair that doesn’t have the features you want. But first let’s take a look at these 8 best nursery nursing gliders in 2019 and find out why they are our top picks, shall we? Preparing for a new born bundle of joy can be daunting especially for first time parents, but with some careful planning you can take the stress out of it. Stocking your nursery with the right products is one way of doing this. One of the most important and practical items for any nursery is a glider or rocking chair. Gliders are a modern version of a rocking chair. They move forward and backwards making you feel like you and your baby are floating in the air. They also include ottomans which allow you to recline and relax. Your new baby will wake up every few hours for feeding which can take some getting used to. You’ll appreciate the comfort of a glider to ease you into your feeds and the inevitable sleepless nights they will bring. The Windsor Glider and Ottoman is spacious and comfortable. The chevron design is stylish and adapts to other spaces once it’s no longer needed for feeds. The chair covers are easy to remove and clean whenever necessary. Safety is an important consideration for parents of a newborn baby. There is no need to worry with the Windsor Glider as it has a solid wood frame for safety and stability. As an added extra there are storage pockets for story books, blankets, soft toys etc. The chair is well constructed with heavy-duty materials. It has enclosed metal bearings for a smooth and silent gliding experience. Despite its components it’s a very easy chair to assemble yourself. If you’re looking for an affordable glider without compromising on quality this could be the one for you. The solid wood construction makes it sturdy and safe for you and your new baby. It will make feeding time more restful compensating for your lack of sleep. If you’re willing to go higher in price a great luxury option is the Naomi Home Lorraine Swivel Glider. This chair has a lumbar pillow that adds extra support to your lower back. Besides gliding back and forth it also swivels 360°. The forward and backward motion helps to rock your baby gently to sleep. A glider is a must-have nursery item which will make feeding time easier and more relaxed. After a few sleepless nights you’ll welcome a comfortable place to relax and cradle your baby to sleep while you feed. You won’t feel like you’re sacrificing quality for price with this product. The Windsor Glider and Ottoman set offers great value for money. It’s not a top of the range luxury item, but it’s functional and does exactly what it needs to. Comfort, quality and functionality make the Windsor Glider and Ottoman an obvious choice for the budget buyer. If you’re expecting a baby, then a glider should be on your list of things to buy before the bundle arrives. It’ll make your feeds so much easier and more relaxed. We’ve done a quick review of the Storkcraft Custom Hoop Glider and Ottoman to help you make your selection. When you’re looking for the right glider there are a few things to consider. Comfort, quality and style are at the top of the list for most. You want to be sure that it glides smoothly and silently. The last thing you want is your chair to wake up your baby with its squeaky parts. Thousands of women across America were surveyed and asked to select the brands they would most likely recommend to their friends and family. Storkcraft was one of them earning them a 2018 Women’s Choice award as America’s most recommended baby furniture brand. The Custom Hoop Glider by Storkcraft is a great example of an award-winning product. It’s an affordable yet stylish glider. There are a variety of colors to choose from to match your nursery décor. The glider is versatile and will outlast the baby years with its durability. It’s made from solid wood and heavy-duty material, giving it a feeling of comfort and quality. You can easily keep your glider looking clean by frequently washing the removable chair covers. It also has storage space which is convenient to store books, magazines or your phone. Overall you will enjoy both the comfort and the practicality of this glider. The Custom Hoop Glider is a great option if you’re shopping on a budget. It’s a solid piece of furniture despite the attractive price tag. You and your baby will enjoy its smooth gliding motion. If you’re a heavier person, the Storkcraft Tuscany Glider and Ottoman might suit you better. It’s only slightly more expensive but caters for extra weight capacity. The high back makes this glider a bit more comfortable too. Storkcraft has a great range of baby furniture. The Custom Hoop Glider is one of our favorites. It’s on the lower end of the price scale, but it’s still a quality product that offers comfort and reliability. It’s important to have somewhere comfortable to sit and relax when you’re up feeding. The smooth and silent motion of the glider is very calming not only for baby but for mom and dad as well. The chair is a great option for smaller people who want to save some cash. If you’re a larger person, it might be best to spend a bit more to make sure you’re comfortable. Overall, we found the Custom Hoop Glider to be a great budget buy. Why is a glider such an important item for the nursery? Your baby will be waking up every few hours through the night for feeds, which can be challenging. You’ll want somewhere comfortable where you can relax and do your feeds. A glider will also allow you to gently rock your baby to sleep once you’re finished feeding. Both you and your partner will be grateful for somewhere comfortable to sit, put your feet up and relax in the nursery. The chair can easily be repurposed once your little one is sleeping through the night. It’s perfect for grabbing a book and doing some reading or just putting your feet up and having a nap; you’ll need the downtime with a baby or toddler around. If you’re thinking ahead and looking for a glider that can be used beyond the nursery, this is a good option. The neutral white and gray colors of the Angel Line Monterey Glider and Ottoman will fit in with any nursery theme or home décor choice. This is a functional glider that has all the essential features you’ll be looking for. The seating space is generous and comfortable. The glider is smooth and silent. There are convenient pockets for storing all your necessary feed items. The chair covers are removable for easy cleaning and the wooden frame is solid and sturdy. The Angel Line Glider is quite compact and can fit into small spaces without feeling cramped. Despite this, the seating space is still generous and it’s a comfortable chair to relax and put your feet up in. This is the glider for you if you’re shopping for long term solutions. Another option is the award-winning Storkcraft Custom Hoop Glider and Ottoman. This product is slightly bigger than the Angel Line Glider and has a larger weight capacity. It comes in both neutral and chevron design and custom wood color options. Chances are you’ll be rocking your baby in this chair a lot: when you feed, when putting baby to sleep and when singing along to nursery rhymes. You’ll need something reliable, comfortable and functional. The Angel Line Monterey Glider and Ottoman is all these things with an affordable price tag to match. You can spend a lot more on a glider but if you’re looking for something that ticks all the essential boxes this is the one. Gliders in this price range generally have mixed reviews so it can be difficult to decide whether to take a chance or spend a whole lot more. What’s encouraging is that the manufacturers are quick to help if there are any issues. Don’t let a few bad reviews hold you back from buying a great product. If you’re expecting a baby, life as you know it is about to change. There are some sleepless nights ahead and for many new moms and dads the thought of this can be exhausting. There’s not much you can do about being woken up at night. What you can do is make sure your nursery is well set up and comfortable for you and your much-anticipated arrival. A glider is an essential nursery item that’ll make your life easier. It provides a comfortable place to feed and rock your little one to sleep. It’s also a place for you to put your feet up, relax and read a book while your baby sleeps. You’ll probably spend a lot of time sitting in your glider which can affect your back. The lumbar pillow and the firm and sturdy base of the Storkcraft Tuscany Custom Glider will support this area. This will help alleviate back pain that can develop when sitting for long periods of time. The soft microfiber fabric, generous seating space and padded arm cushions make the Storkcraft Tuscany an extremely comfortable chair. It’s suitable for use over long periods of time and the 250 lb. weight capacity is enough to support larger individuals. The Storkcraft Tuscany Custom Glider has all the essential features that you would expect from a quality glider: storage space for your favorite books, removable cushion covers for easy cleaning and a smooth glider. It comes in a range of attractive colors to fit in with your home décor. The Tuscany Glider is a good example of why Storkcraft is an award-winning brand. The Storkcraft Tuscany Custom Glider is a bit more expensive than some other options on the market, but the extra features are worth it. The lumbar cushion, extra arm padding and seating space make this glider a great choice for back health and comfort. Another option is the Storkcraft Custom Hoop Glider. It’s slightly cheaper but has similar features. This option doesn’t come with the extra lumbar cushion but the rounded back gives it a stylish finish. 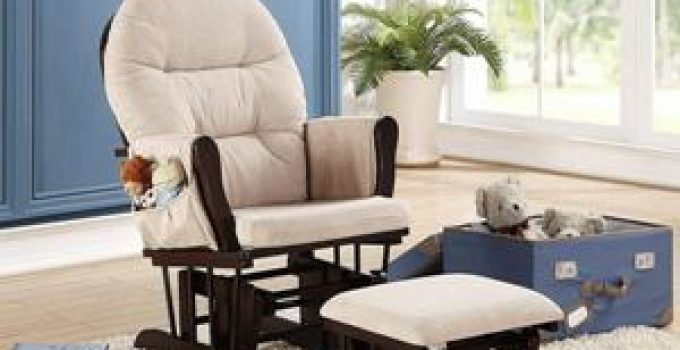 The Storkcraft Tuscany Custom Glider is a solid and comfortable glider for the price. We doubt you’ll be disappointed with it. For only slightly more in price this chair has a few added extras that the entry-level gliders lack. We were impressed by the stylish look of the chair. It’ll fit with any décor in your home which means you can continue to use it once baby has outgrown being rocked to sleep. If you’re wondering whether you should get a glider for your nursery, the answer is YES you should! It’ll make your life easier and more comfortable at a time when you’ll be feeling exhausted from lack of sleep. There will be times where you’ll do just about anything to help your baby snooze again. A glider will help you create a gentle rocking motion while you cradle your baby. Rocking is an effective way to get babies to fall asleep because it reminds them of being in the womb and moving around. It’s also a great place to relax and put your feet up while feeding. Quality, price and comfort are three important considerations if you’re looking for a rocker. There are some great quality gliders on the market at reasonable prices. You don’t have to compromise on quality just because you’re shopping on a budget. The DaVinci Olive Glider has received some excellent reviews and it’s easy to understand why. At first glance it looks like an ordinary sofa chair but if you take a closer look you’ll see a stylish and great quality glider. The lumbar pillow provides extra lower back support and the high back provides back and neck support. The metal base allows a 360° swivel and a back and forth gliding motion which will gently lull your baby to sleep. The heather-hued polyester fabric is soft and durable and comes with a fully upholstered ottoman to put your feet up and relax with. The DaVinci Olive Glider looks like an upmarket sofa chair that wouldn’t be out of place in your living room. Although it’s quite compact and narrow it’s comfortable and offers back and neck support. You’ll love the range of motion you’ll get from the swivel and back and forth glide. This will help soothe your baby right to sleep. If you like the DaVinci Olive Glider but need something a little larger, the DaVinci Maya Swivel Glider is a good option. It has similar features and looks and feels like the Olive Glider but with a bit of extra seating space. This option also has pillow-back cushioning and plush arm rests to give it more of a luxurious feel compared to the Olive Glider. If you’re looking for a sofa chair that’ll fit into your living room once it’s time to move it from the nursery, this is the perfect glider for you. The main attractions of the DaVinci Olive Glider are the swivel and glide motion, the lumbar pillow for lower back support and the high back for back and neck support. You’ll spend a lot of time in this chair, relaxing, feeding and cradling your baby so the added back and neck support will be appreciated. Do it – you’ll thank us later. A nursery wouldn’t be complete without a glider. This modern day version of a rocking chair is great for feeding, bonding and napping. Its backward and forward gliding motion gently eases baby to sleep. A glider adds comfort at a time when you’ll be feeling exhausted from sleepless nights. It will also be a special place where you and your new bundle can bond over feeding or story time. You and your partner will spend a lot of time cradling your baby in the glider, so it’s a good idea to make sure you know what features you want. The Davinci Maya Swivel Glider is versatile and elegant. The neutral cream color can be matched with any home décor style. The piping gives it a luxurious finish that will complement your nursery or living room. It comes with a fully upholstered matching ottoman for extra comfort. The chair is mounted on a metal base which allows a 360° swivel as well as a back and forth glide. With this range of motion, you’ll be able to find the best way to rock your baby right to sleep. You’ll find getting out of the Davinci Maya – with your baby in your arms – easy because of the shallow seating. Although it’s a compact glider with a low back, it’s still firm and comfortable for feeding or relaxing in. This product comes fully assembled so you can just take it out the box and start using it without any hassle. If you’re looking for a more luxurious glider that will add a touch of elegance to your home the Davinci Maya Swivel Glider is a great choice. It will also be a good companion for late-night feeds and the occasional nap while your baby is sleeping. The swivel and glide function will rock baby to sleep in comfort and style. This is not a budget option but it’s versatile and fits with any décor. Another option is the Baby Relax Swivel Glider and Ottoman. It has similar features and a similar look and feel but it’s slightly larger than the Davinci Maya. If you’re a larger person or if you would like to continue using your glider with your toddler, then you’ll be grateful for the extra space. There are many different styles of gliders available on the market. When deciding which one is best for you, an important question to consider is whether you’ll want the glider once baby is all grown up or will you be passing it on? If you want a functional glider that will also double up as a stylish furniture piece in any room of your home, the Davinci Maya Swivel Glider is the way to go. Rocking chairs have been around since the early 18th century and they’re still a great way to get babies to fall asleep. A glider is the modern version of a rocking chair with a slightly different motion. Instead of rocking back and forth a glider, as its name suggests, makes you feel as though you and your baby are gliding through the air. Today we are spoilt for choice when it comes to gliders. They come in all shapes and sizes and with a variety of features. If you are browsing the market for one, why not consider a glider that can also recline? The Dutailier Sleigh is multi-functional; it’s both a glider and a recliner. The back rest is fully adjustable allowing you to lie back and relax with your baby. It has a handy mechanism which locks the chair into one of six positions. With this feature you can easily find the perfect angle for feeding and cradling your baby. The cushions and arms are well padded for added comfort. The ottoman which is included with the chair is also a glider which creates a smooth and continuous movement. If you’re looking for maximum comfort from a glider and you’re willing to spend a bit more, the Dutailier Sleigh is a good option. You’ll be spending lots of time in your glider when you’re nursing so comfort is key. The recliner allows you to get extremely comfortable during your feeds, you may even nod off to sleep once you’re done. If you find a position that works for you, no problem, you can lock the chair into position and relax. This chair has all the bells and whistles of your average glider with the bonus of being a recliner too. You’ll even love it after baby has grown and you’re reclining in front of the television. If you prefer an all-in-one recliner instead of a recliner with ottoman and glider, the Naomi Home Odelia Swivel Gliding Rocker Recliner offers this. It swivels 360° and glides back and forth. The movement of this chair is operated by a conveniently placed lever giving you full control over the chair. If you’re going to buy a glider you may as well spend a bit more and get the reclining option. You’ll want to keep the chair after your baby has outgrown it and a recliner is a very useful and comfortable piece of furniture. Rocking is the quickest way to soothe your baby to sleep. The back and forth gliding motion gives enough movement to find what works best. If you’re concerned about quality, you can rest assured with Dutailier; it’s a brand that has a proud tradition of craftmanship which has been in existence for over three decades. Now it’s time it serves you too. Comfort and style are rarely used in the same sentence as sleepless nights and crying babies. A glider and ottoman combo is a must-have nursery option for this very reason. When you’re exhausted from sleepless nights you’ll want somewhere comfortable to gently rock your baby to sleep. Gliders are not only for rocking baby to sleep, they’re also great for feeding time, story time and for nap time (for both you and your baby). You’ll be spending lots of time in the nursery so it’s essential to have a comfortable chair to unwind in. Gliders come in a wide variety of prices, features, colors, shapes and sizes. You’ll want to think carefully about the features you want and what your budget allows. Most of the entry-level gliders provide nothing more than a comfortable chair with a glide function and an ottoman to rest your tired feet. When you spend a bit more, a glider can include swivel and recliner functionality. Do you plan on keeping your glider once your baby is all grown up? If so, you’ll want a glider that matches with any kind of décor. Neutral colors and styles are best in this case. The Comet Doe is a sofa chair-style glider made with microfiber material and clean lines giving it a contemporary look. It has a swivel and smooth glide function for rocking your baby to sleep. The seat is wide and spacious and the seat cushion and back have thick padding for extra comfort. This glider is a great option for the décor conscious buyer as it will fit into any room in your home without looking out of place. It also has a solid wood frame and a sturdy construction. The chair comes in a few neutral color options including gray and brown. The soft material coupled with the wide seat make this glider a comfortable option. It’s stylish and sturdy, and easy to maintain. It glides and spins effortlessly on its metal frame. The movement of this chair is silent and smooth. With all these features you’ll find that the Comet Doe offers great value for the money. If you’re willing to spend a little extra, the Pulaski Sutton Swivel Glider Recliner is another great option. This chair is also a recliner which is great for taking naps and relaxing with your baby. It has a similar soft material and comfortable padding which is surprisingly easy to clean. The Comet Doe is a sturdy, stylish and functional glider. It has everything you could want in a rocker and more. If properly taken care of you’ll have this glider in your home for many years to come. If you are expecting and are outfitting a nursery, you need to check out one of the key furnishings — a glider with an ottoman. This is an essential piece of furniture as it makes it possible for you to relax while you feed your infant. The glider today replaces the former rocking chair and is considered safer. That is because this type of rocker slides back and forth on a fixed rack, thereby making the furniture more stabilized. To enhance the stability of the glider, make sure that your feet touch the floor and you have good support for your head and back. You can find a glider and ottoman that meet your needs by carefully reviewing the features online. Two primary kinds of gliders are featured in the marketplace. Either they are wooden gliders or upholstered for optimum cushioning. However, these two types of gliders can be broken down further. For example, of the wooden gliders that are offered, you can choose from sleigh-type gliders, transitional designs, curved, grand, two-post, and bow-configured furnishings. Upholstered gliders vary in style because they come in a variety of fabrics, colors, and patterns. Compared to a wooden glider, an upholstered glider is obviously more comfortable because it features a cushioned place to sit. However, if you are limited on space, a wooden glider is your best bet. Also, you can add removable cushions to wooden gliders to make them more comfortable. Just make sure that the cushions are easy-care, meaning that they should be machine washable. Some add-on features that usually are displayed by wooden gliders include padded armrests with pockets as well as lumbar support for the back. If you want to forego the ottoman, you can buy a glider, either wooden or upholstered, that features a built-in footrest. This footrest saves on space if you are limited in this respect. The glider is a preferred way to watch infants today as it provides a 360-degree swivel feature. This amenity makes it easier for a parent to keep his or her eyes on a baby or toddler in the nursery. Most of the gliders that you will see for sale will come with an ottoman. While built-in footrests are featured on some of the furnishings, gliders are best known for the extra ottoman. You can find gliders that represent the following popular styles. Traditional gliders are sought after by parents who wish to convey a timeless look to a nursery’s décor. This style is available in classic looks and may be purchased as a traditional wooden glider or a glider that is upholstered with classic rolled arms. Contemporary gliders are among the most popular gliders purchased today. These gliders are offered in a wide range of sizes, shapes, and designs. Compared to other styles of gliders, these gliders are usually more streamlined or offer more structural definition. These gliders appear to be more feminine and are chosen by women who wish to add a softer touch to the nursery. You can choose from lovely floral motifs or pale yet vibrant hues. This glider is the ideal pick for a baby girl’s nursery. To maintain your glider and ottoman, make sure that the cushions are made with a material that can be maintained with a stain-safe cleaner that is non-toxic. While this type of cleaner is not designed to prevent stains, it will provide an additional protective layer. If the glider does not come with a built-in footrest, one of the major features to consider is the ottoman. This added furnishing enables you to rest your feet and relax. Ottomans are designed to glide to and fro or stay stationary. If the ottoman does glide, it may also be designed to swivel around. The ottoman may be sold separately or be matched as part of the glider. Some gliders are featured with a backrest that adjusts. Many mothers like this feature as they can adjust the backrest for optimum comfort. This comes in handy if you are singing or rocking your baby to sleep or feeding your infant. This type of cushion is preferred by parents who like more traditional glider designs. This type of cushion is usually detailed on the back part of the chair. You may also be interested in other features such as pillows, cup holders, or pockets. Ottomans that come with gliders also are designed to provide storage. You will be using the glider to relax. Therefore, it is imperative that you find a seating arrangement that meets your criteria for comfort. The best way to do this is by testing the glider yourself. If your spouse will be using the glider too, you should both check it out for comfort. The best way to ensure comfort is to buy a glider that features a wide seat and arms that do not make you feel claustrophobic. A wide expanse is necessary if you plan to use a nursing pillow. Once you start breastfeeding, you will find this extra room helpful. While some gliders showcase pale or pastel cushions, you may want to consider darker colors if you will be using the glider extensively. If you are planning on having more than one baby, this is an important factor to contemplate. Pastel or beige tends to soil more easily than darker fabrics. Is the Cushion’s Fabric Easy to Clean? Babies can make messes. Therefore, you need to make sure that your cushions are easy to remove and clean. Preferably, it is better to choose glider cushions that feature removable covers that can be thrown into the washer and dryer. You also want to make sure that you can lock you glider in place if necessary. If you have a toddler running or playing beside you when you are feeding your infant, this safety feature is a must-have amenity. Little fingers or small hands may get entrapped in the gliding mechanism. Are There Springs Beneath the Seat? Check beneath the glider and look at the fabric beneath the cushion. It should have springs affixed to it. You should see four springs securing the bottom part of the material to the chair’s frame. Do not choose a glider where the fabric is merely glued to the frame. This does not afford enough shock absorption or support. One of the best ways to ensure that you can afford your glider is to ask for the furniture as a baby shower present. Instead of everyone buying a separate gift for the shower, ask that they chip in and buy the glider instead. This will not be too much of a financial hardship, especially if you have several friends and family who can all chip in. Plus, you will be receiving a much-needed item for your nursery. Otherwise, look how much money you can spend on the furnishing. Usually, a glider and ottoman range in price from around $150 to over $2,000. This is a must-have nursery item along with the crib. Any nursery that does not feature a glider and ottoman is simply not complete. Choosing a glider without an ottoman makes it incomplete. Therefore, it is best to buy both pieces when you are making this furnishing selection. Above all, make sure that the glider is easy to clean. If you want to make the best investment and avoid buying another glider, you need to choose a glider that is easy to clean. Go online today and review the offerings. That wraps it up for this detailed guide on choosing the best nursery nursing gliders 2019. If you opt for a glider and ottoman, make sure that the ottoman features storage. This will help you optimize your space. It is also helpful to choose a glider that features pockets on the side for organization and easy access to the baby’s bottle or nursing pads. Whatever helps you to get your baby to sleep or feed him or her will be a supportive amenity. Some mothers wonder if they should include the ottoman. By all means, add this furnishing, especially if you want to rest your feet. If the glider already has a built-in footrest, you might forego this piece. However, it still might be a good idea to buy it if it provides storage and can be used later, for instance, in front of a dresser or in the living room.